Jaimie’s Purse is committed to providing support to Minnesota families affected by pediatric cancer. Jaimie received her last chemo treatment for Acute Lymphoblastic Leukemia (ALL) in September 2014, or so we thought. After nine months of remission, Jaimie was diagnosed with Acute Myeloid Leukemia (AML,) a secondary type of cancer. For the second time, Jaimie began chemo, and underwent radiation therapy, in preparation for her bone marrow transplant (BMT) which took place on August 13th, 2015. After fighting for three excruciating months, Jaimie lost her battle. 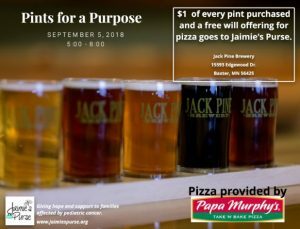 Come down to Jack Pine Brewery and purchase a beer ~ for every beer bought, Jaimie’s Purse, will receive $1 of that money. Can’t stay for a beer? Swing in and pre-purchase some beer tokens for a later date. 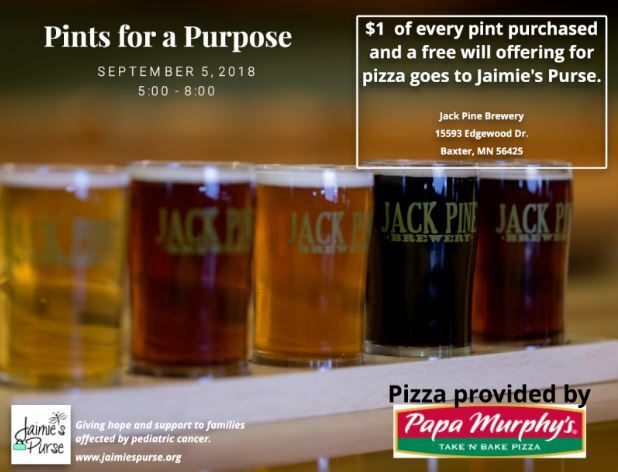 Pizza provided by Papa Murphy’s.